We Survived the Quartzsite Big Tent! The Big Tent, The Main Event, The Big Show……call it what you want, it is basically a week of chaos here in Quartzsite. RV’s pull in by the thousands the week of the show and traffic comes to a standstill. We went to the Big Tent three times over the week to take in the sights. Between the dogs in strollers, wagons or just on leash and the people who just stop in the middle of the aisle to talk, it is a serious test of patience. But hey, it is all part of the experience right? This year seemed to have a slightly higher percentage of RV related items compared to last year. LED Light booths, tire pressure monitor vendors, RV décor, axle vendors, work camper booths and a handful of parks had booths inside and outside the tent. We made a couple of purchases during our visits; a replacement sensor for our tire pressure monitoring system, a couple of stick clips to seal your bags of chips, a couple of LED lights and one purchase that has me wary and suspicious..... Our favorite booth was a metal artwork booth (Mountain Metal AZ on Facebook) with a lot of wildlife designs. Barb picked out a welcome sign that she said she was going to put above our door to in place of the wooden sign that bonked me on the head a couple of weeks ago. Well, as she was picking out the perfect piece she kept testing the edge of the 18 gauge steel to see how sharp they were. I think she has given up trying to crush me with stuff and upped her game to decapitation! Hopefully those 3M strips hold the metal better than they did the wood! If anyone is looking for ideas for our next Christmas gift here it is! Our new sign above the door, also known as the decapitator!!! What continues to surprise us is the number of non-RV related booths. I guess in a roundabout way they relate to RV’ers and the demographics that flock to Quartzsite for the show but much of it is not what we are looking for. There had to be a dozen booths that advertised an age cream or powder and an equal number of booths touted that they could fix whatever else ailed ya…bad back, bad arches, bad heels, they had a cure. A ½ dozen booths demo-ing mobility carts only added to the chaos. Who doesn't need an animated dog with sunglasses? How about a cooking demonstration? Toys for the kids perhaps? What RV'er doesn't need a hot tub? There were times you could go and avoid most of the crowds, just stay away from the first few days and mid mornings and you will find it a little more manageable. There are also a ton of events going on throughout the week. We attended Bloggerfest here at La Posa South where 20 or so couples attended. It was great to meet in person some of the bloggers we have been following or have been following us. We were reminded once again that Daisy and Dakota are the stars of our blog as more than one person recognized them before know who we were. One interesting thing was that almost every blogger there started blogging for one of two reasons; one was to keep a journal of their adventures to refer back to in the years to come and the second was to keep their friends and family in touch of what they are up to. Interestingly almost everyone of them said that their families are the people who read it the least! Two people we were looking forward to meeting were Shawn and Kim from Missouri. Shawn had been following our blog for a while and it was nice to meet them in person. The festivities all but over several of us made plans to attend a BBQ event in town from 4-8 Saturday afternoon. Barb had been craving ribs for the past couple of days and we starved ourselves in preparation for this big event! So at about 4:15pm we, along with Steve and Dianne, and Harry and Vicki headed over to the event. When we arrived at the event with our anticipation levels high and our hunger even higher, the smell of BBQ was in the air and there were numerous BBQ trailers throughout the area. Walking in there were people gathered around the stage and they were announcing the winners of the contest as we took mental note of the trailers to hit. After they announced the first place winner and presented them with a check for $10,000 they thanked everyone for coming and started packing up. Wait, what? It’s over? There is no food? We are only 20 minutes late! Noooooo! Ends up the after event party was starting at 4 and all the trailers were shutdown. Still determined we ordered a couple of beers and walked the area looking for any scraps of leftovers. Nothing….. So we drove by Silly Al’s…packed, Grub Stake….packed….so we head back to our rig and put together some quick horderves where the six of us watched the sunset over the mountain enjoying great company and great conversation. Thanks for the pictures Steve! Speaking of Steve and Dianne, they hosted a 42 mile ride one afternoon with a total of 7 ATV’s attending. Cindi and Roger, Susan and Guy, Rowdy and Missy as well as Jim and Brenda went on a ride to many of the attractions on the northeast side of town. Some kind of mineral in the quartz.....copper? People leave the weirdest things in these cabins! The Ocotillo are really getting green! This is our last week here as we are scheduled to leave next Thursday morning to head south. As a result we are trying to jam in as many things as possible, it is going to be a busy week! 4,000 Miles in 4 Days! Ask fulltime RV’ers how many miles they travel on a typical day and you will get a variety of answers; 200 miles? 300 miles? Certainly no more than 400 miles……so traveling over 4,000 miles in 4 days is absolutely crazy! Who would do that?!?! That is exactly what I did over 4 days last week. To be fair, I did have a little help from both Delta and Spirit airlines. 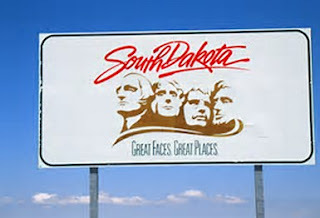 The mission was to fly from Phoenix to Minneapolis then drive from there to Custer, South Dakota to have another look at a piece of land we were interested in. Kind of like a mini vacation! Why fly into Minneapolis instead of Rapid City you ask? First it was crazy expensive to fly into Rapid City and second, my friend Kevin volunteered to come along. Since he is a general contractor his advice and support would be greatly appreciated. Roundtrip the flights were a whopping $135 with taxes included on two different airlines. This was reduced $85 after receiving an unexpected credit on our credit card for booking airline travel. How cool is that? Having never flown Spirit Airlines I did not know what to expect. We knew they were a low cost budget airline but did not really know what that meant. The first thing we found out is that they do not serve a beverage or a snack…. No problem. The next thing we discovered is that there is less leg room then other airlines…..Again no problem. But after borrowing a carryon from Steve and Dianne and packing for the trip we discovered that they charge $45 carryon luggage. Yikes, that really cuts into the low cost tickets! You could however carry on a personal item as long as it was no bigger than 16"x14"x12". Other potential fees include; a $35 fee if you need agent assistance when booking your trip, a $10 fee if you need your boarding pass printed out by an agent (free at in airport kiosks), and a seat assignment fee from $1-$50 if you want to select your seat (random assignments are free). My challenge was to avoid the $45 carry on fee; I considered wearing four pair of underwear, socks, shirts and jeans walking onto the plane like the Michelin man! Instead I emptied out my camera bag, rolled, stuffed and jammed 4 days of clothes into such a small little case. The flight itself was great. I rolled the dice and went with the free random seat assignment. The flight was virtually empty so I had a row all to myself. I would definitely fly Spirit again. My brother Bob picked me up at the airport about 7:30pm and drove back to his house. I had not seen him and his wife Greta in over a year! We visited until about 11:00pm before we called it a night. The highlight of the evening was the fact that Greta made chocolate chip bars for me to take on the trip...Thanks Greta!!!! Kevin picked me up about 5:15 the next morning and we drove the 10 ½ hours to Custer. Barb and I have pretty specific criteria in what we were looking for in land. Number 1 it needs to be remote, no neighbors, we don’t even want to see our neighbors. Our #2 item is the view, whether it be a long distance view or we can only see 100 yards we would like our view to shout Black Hills. This was the easiest of the criteria as almost every piece outside of town checked this box. Last but not least is accessibility. Finding property with all three of these criteria in our price range is somewhat challenging. There is plenty of property for sale but most are very close to roadways or have neighbors in close proximity. Many of the remote properties were 100 acres or more pushing it out of our price range while others were so remote they only offered seasonal access or did not have electricity in the area. Armed with a list of about a dozen pieces we were interested in we started our search. First up was a remote 80 acre piece of property outside of Pringle that Barb and I walked in November that we were really interested in and wanted to get another look at. It had incredible views and plenty of wildlife in the form of deer, elk and turkeys. But after walking it with Kevin he pointed out that building a road, driveway and running power onto the property would be too expensive to make it viable. We walked each of the properties on our list slowly eliminating them for one reason or another. In the end we had three properties that met all our criteria with our top choice being a 20 acre piece ½ mile down the road from the 80 acre piece we originally liked. Located right on a nice gravel road, it had power along the property line, a combination of open and woods with a deep ravine running through it, great views and lot of wildlife! Next step is to get Barb up there to look at it in early April! Satisfied we had a successful trip we drove back to Minneapolis and Kevin dropped me off at the airport on the way by where I waited 2 hours for my flight back to Phoenix. The Delta flight back great, it was on a 575 and again had a row all to myself. While working I flew quite a bit but I bet it had been 7 years or more since I have flown out of Minneapolis. The airport has changed quite a bit for the better and each of the seats on the 757 had a monitor where you could watch shows, play games and get flight details. Very cool! 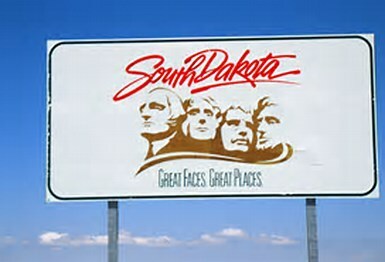 We are pretty excited about this adventure and if everything goes well we will be South Dakota landowners in the spring! In the meantime the Quartzsite RV Show is in full swing here in so there is lots to see in and around town! Fun with Friends in Quartzsite! The Long Term Visitor Centers are really starting to fill up. With this comes seriously slooooow internet. It is so bad that several of our friends who work out of their rig and rely on the internet have vacated the area. This will continue until after the show. Along with this influx of people come a number of really cool, unusual and truly bizarre accommodations. I say accommodations as you cannot call some of these rigs. You everything from $500,000 rigs to tiny houses, people living out of van and other living in tents. The line at the dump stations is also growing. The wait at the peak of the show can be up to 2 hours! If you time it right, you can still get in and out in a few minutes as it seems everyone rushes to the dump and water stations first thing in the morning but in the late afternoon (happy hour/dinner time) you can usually drive right up without a wait. More new arrivals means more happy hours! Friends Harry and Vicki arrived this week, we celebrated by going to the Desert Bar. For those of you unaware of this bar it is located several miles outside of Parker and several miles down a VERY rough road. The bar is totally off grid and operated solely on propane and sun power. The number of solar panels there is incredible! Our most bizarre incident of the week when we were on a wheeler ride with Steve, Dianne, Roger and Cindi. We were giving Roger and Cindi a tour of some of the local attractions; Erdman Mine, Yum-Yum mine, the Indian grinding holes and a couple of stone houses. The Yum-Yum mine goes pretty far back into the hill, probably a few hundred feet. You can see fairly well the first 50 yards or so but after that you need a flashlight. We get in about 100 yards and you cannot see your hand in front of your face without a flashlight and this creature appears on the side of the cave wall! We don't know exactly what it is/was but think it is a coyote based on the pointy nose. It had either died in the cave or if someone brought it in but seeing that was definitely bizarre! After that encounter we all decided that we needed a beer and headed to Beer Belly’s for some refreshments and music. then Cindi gave it a try! Speaking of beer, as many of you know we love to visit breweries but this area of Arizona seems to be devoid of such establishments so instead of driving hours to find one, we brought the brewery to us! We had our first (of what I hope is many) Quartzsite beer tasting. When Barb was at Total Wine and More in Phoenix, she picked up a variety of beers using their Build You Own Six Pack promotion. Now we just had to find someone who appreciated beer...hmmm....The Colibaba's! So we had then over for this event and tasted a variety of beers. Happy Hour Week at Quartzsite!